Nintendo is working with mobile phone carrier NTT on new voice recognition tech that can convert spoken words into text. The tech is aimed at students with disabilities. Words are converted to text, and the data is stored and accessed through the cloud, allowing students to also review and study later as well as see spoken words written in real time. 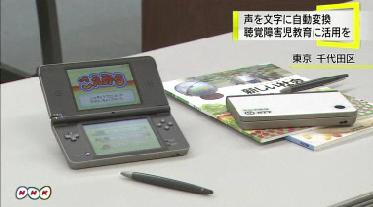 The idea is that when the teacher speaks, the DSi becomes a mini blackboard the students can hold in their hands. Trials are starting at schools in both Tottori Prefecture and Okinawa Prefecture. The goal is to eventually have hearing-impaired children use the DSi and this software as a communication tool outside the classroom.